3. Beat in eggs then stir in the cream, milk, liqueur, cinnamon, vanilla and bread. 4. Once well combined fold in the sliced bananas carefully. 5. Pour into a 13x9 baking dish and cook for 90 minutes or until completely set. 6. This can be served hot, room temp or cold. It can be topped with vanilla ice cream, whipped cream or as I did with the following topping. 7. In a sauce pan over medium high heat melt the butter then add the brown sugar. 8. 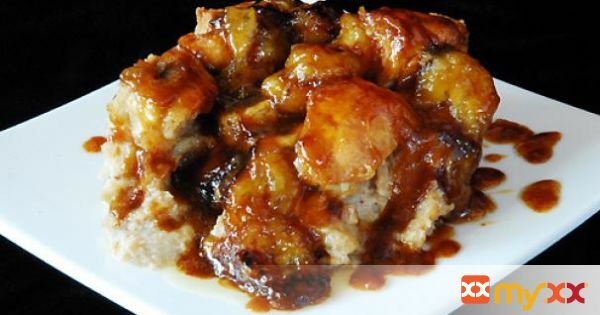 Once melted add the banana slices and stir gently, cook until the syrup has reduced and the bananas have caramelized. 9. This will take about 5-10 minutes, be careful to not let your sugar burn. 10. When ready ladle some of this hot sauce over each serving of bread pudding.